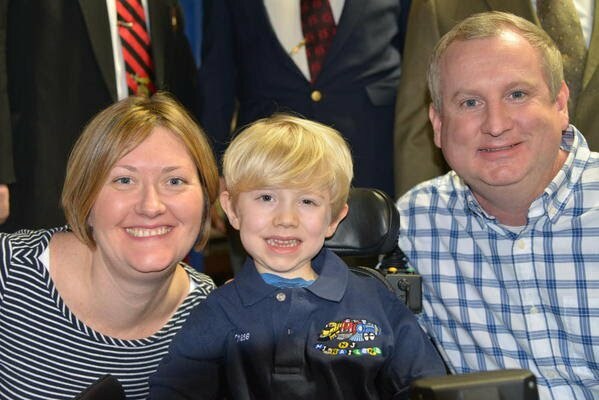 A few months back a little boy named Chase brought his parents to one of our open houses. Chase loves trains and loved our layout. His parents couldn't get him to leave and they stayed the whole day. Chase is handicapped and confined to a wheelchair. Chase's father was talking to one of our members named Sy Mendel most of the day. His father was telling Sy how he wants to get Chase a motorized wheelchair but really couldn't afford one. Little did Chase's Dad know is that Sy was very active with the Shriners Children hospital in Philadelphia. Well one thing led to another and Sy got Chase's father connected with his friends at the hospital. Chase is getting free treatments at the hospital and also received a top of the line motorized wheelchair that was valued at $10,000 dollars absolutely free. This came about because of Chase's love of trains. In October Chase's father called Sy and asked if he could have Chase's birthday party at our club. He was willing to pay per person and had about 10 children with their parents coming. The party coincided with our Halloween open house so we decided to treat Chase and his family and friends to a birthday party NJ HiRailers Style. Chef Vinny cooked up a storm and his guests had a ball. I posted some of the pics from that day. We just bought Chase a club shirt and have made him an honorary member of the club. I think we have friends for life. To try to do our small part for the Shriners hospital we produced a 2015 calander which we sold to raise money for the hospital. We got to see Chase again at our open house on 2/8/15. We presented Chase with an NJ HiRailers Shirt with his name on it and we presented the Shriners Hospital with a check for $1,000. We thank all of you who purchased our calendar and took chances at our open house because the proceeds went to a great cause. 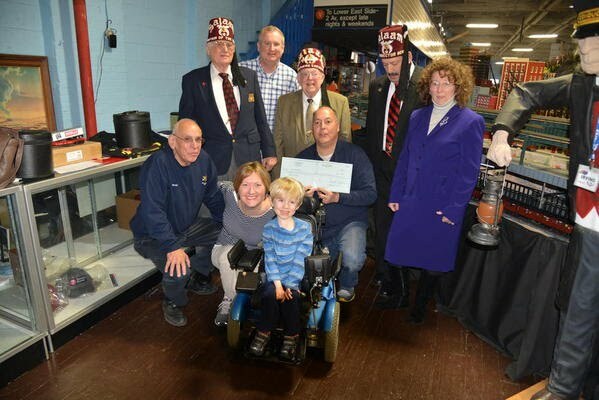 The photos below are our own Kevin Martin along with Bernie Callen with the representatives from the Shriners hospital with Chase and his parents. Chase Kopczynski, Lorraine, his Mom, Andrew, his Dad, RoyHezfeld, Charlie Willer, Alan and Irene Linder. The man with the child is Mr. Mark, Peerson, Potentate ( he is like the Grand High Exhalted Mystic Ruler ).